and visitors in a safe and secure area with proper access control. for wide variety in clothing including designer wear accessories and shoes. Fabulous eats and treats- and dazzling gifts, Home and Décor concepts and products for everyone. 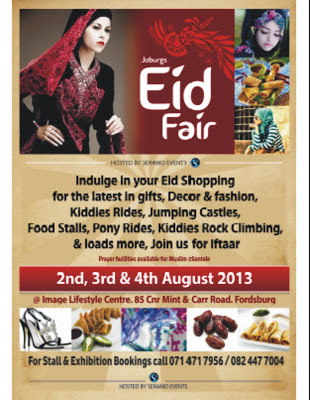 spend and spoil themselves and their families, in the spirit of Eid! alike. In a densely populated area, attracting the medium to upmarket trade. Added advantage of extended trading hours, as customers will enjoy evening shopping as well after sunset. If you are interested in booking a stall, email us requesting for booking forms.